As Easter is rapidly approaching, I have started to think about how I will entertain the family when they are off from preschool and work. This will be our last year of having Lily at home during school holiday times since she starts school in September so I really want to make the most of our time together. Having said that, ask me how the holidays are going this time next year and you may find me a teeny bit frazzled! Who knows what the weather will be like, so aside from having an Easter egg hunt in the New Forest (providing the puppy doesn't find the chocolate first! ), arts and crafts and family time on the sofa in front of a good film may be the order of the day. Sometimes a sit down and an enjoyable film for all the family viewed from a high quality screen such as a Panasonic 4K TV is perfect for easing into holidays after busy times at work, or for winding down the inevitable holiday excitement before a new term begins. But what films would be perfect for the festival of Easter? Bring forth the Easter Bunny himself, featuring in films such as Rise of the Guardians and his teenage bunny son is the main character in Hop. We haven't watched Hop yet so that may be one for the checklist and we already own Rise of the Guardians so no doubt we will turn that on at some point, even though that particular Easter Bunny is not how I'd picture him at all! I'm also keen to discover a movie which explains the meaning of Easter to preschoolers as opposed to thinking it is a celebration of chocolate. An Easter Carol by Veggie Tales may be ideal as it explains why people all over the world celebrate this holiday with a Charles Dickens spin. How about you? 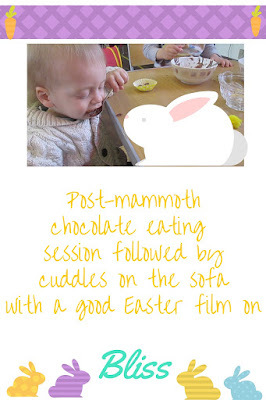 What will you do with the kids during the chocolate-fuelled holidays?